I was able to take part in two actions in Northern California yesterday (for more information on the actions held around the country, visit fightofr15.org). Outside a McDonald’s in Oakland, dawn barely broke and Fight for $15 kicked off their first Bay Area action of the day. Lisa, a student supporter of Fight for $15, walked with low wage workers for union protection. During the action she said, “The [pay] is such a struggle with inflation to match. Wages always need negotiation. 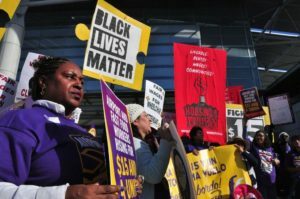 Unions are working on behalf of the workers” The action ended with nearly 50 workers participating in civil disobedience, shutting down the streets to call attention to their fight for justice. Workers with the Fight for $15 have won significant victories across the nation including a path to a $15 minimum wage in California signed into law this year. 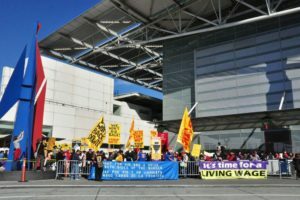 The SFO action celebrated and acknowledged how far low-wage workers have come in this fight for justice since their first protest in 2012. Colorful streams of signage and coordinated shirts crossed the international terminal, and a large flag reading “TIME TO RISE UP” waved against the blue skies. The crowds cheered on in chants and smiles.